I ran into Augie the other day. Augie and I go way back. Augie, by the way, is short for Augustus Matthews Buford Fuller. How he got that name is another entirely different story. We were in the Army together way back in the early 70’s and we’ve stayed in touch ever since. Nowadays, he lives back up in the woods (you know, so far back they have to pump sunshine in and moonshine out) so he does not get into town very often. When he does come to town, he calls me and we meet at the coffee shop and visit for awhile. Augie is not the sharpest knife in the drawer but he’s a good fella. He works hard and never takes a dime he hasn’t earned. Well, we were having coffee the other Saturday and Augie was telling old Army stories. He was joking that he knew enough never to get on the bad side of the company clerk, the cook, or the mail clerk. He thought of that because of the time he got sideways with our cook. See, Augie was a mechanic in the Army and a good one. He could fix near anything. Well, the cook got hold of Augie one day because the mess truck was broke. It’s kind of hard to feed soldiers if the truck’s broke. Augie was busy but told the cook he would be over as soon as he could. That turned into three hours and that made everybody mad. Supper was late for the whole battery and that made Augie very unpopular. Well, on this particular training exercise, lunch each day was C-rations. That’s the food the Army used to hand out in a small box. It contained dark green cans of various things that were rumored to be edible. That’s the claim though I think it might be disputed by many a veteran. Anyway, the cook would take out all the meat cans and put them in a steel trash can full of water that had a heater in it. He would heat these cans up and soldiers would line up whereupon the cook would grab one out with tongs and pass them out. A lucky draw would result in a can of spaghetti and meat balls or beans and weenies. If one got on the cook’s bad side, the draw would be something called ham and chicken loaf. It’s kind of hard to describe ham and chicken loaf. Try to imagine the stuff they reject at a dog food factory. That does not begin to paint a picture of how bad this stuff looked and tasted. Many a soldier went without a meal to avoid the gastronomical disaster that awaited anybody who ate this stuff. Well, Augie’s punishment for his tardiness in fixing the mess truck was ham and chicken loaf for SEVEN straight days. Augie’s a pretty smart ole fella. We’ll talk to Augie again soon I hope. 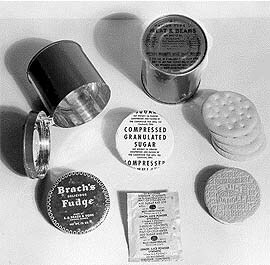 We had food (such was the claim) that was called “C-rations” to eat while in the field during my Army days. The Army would say they developed this alleged 3,700 calorie meal prior to World War II. I would respectfully dispute that claim as I distinctly recall in 1974 having a C-ration meal that had a pack date of 1467. Some of the items were actually palatable though I would not care to try any of them today in deference to my aging digestive tract. Now, a lot of times there was no way to heat this stuff. There is no experience like living in a tent (GP-medium for you vets out there) without heat in sub-zero temps and having to consume something called “Ham and Lima Beans” that was packed in a tin can and looking remarkably like the contents of a can of dog food. The further indignity involved eating this stuff cold. Being the inventive G.I. that I was (all G.I.’s, by necessity, are inventive), I searched and found a way to heat this poor excuse for sustenance. I would wedge a can of whatever that needed warmed up into the exhaust manifold of one of the trucks. Ten to fifteen minutes of engine idle time and I could at least have whatever it was at some temperature above frozen. It worked out pretty well most of the time. I don’t remember his name. He was a fairly new arrival to our Artillery Battery (Vets: it was Svc Btry, 1/36th FA based in Augsburg, Germany). He had been lucky to get a can of spaghetti and meat balls in his c-rations. As a side note: spaghetti and meat balls were the best C-ration meal one could get back then. Anyway, being a new guy, he did not have the extensive “wisdom” that the old soldiers like me (I was 20 – maybe) so he asked a couple of us how to heat his dinner. He was instructed how and where to wedge his can in the exhaust manifold of a nearby 5-ton truck. What he was not told apparently, was of the need to put a few vent holes in the can. Have you ever seen what happens to a can of spaghetti and meat balls that has been heated without benefit of a vent hole or two? The can exploded with the hood of the truck down. An entire can of spaghetti and meat balls was splattered all over the engine compartment, helped along in its destructive path by a still running engine. Now, heating one’s c-ration in an engine compartment was strictly forbidden by the powers that be. We had no clue where he got the idea to do that. None of us told him and, of course, we would never do that ourselves. Sure took him a long time to clean that engine. There was the night I spent in a phone booth at the train station in Buchloe, Germany. Nope, not telling that one. Then there was the time when I fell off a fence I was climbing over and cracked a rib or two. That story will never be told. There was the girl I met at the American Hotel in Augsburg, Germany in 1975. I can state unequivocally that THAT story will never be told. I swiped a canvas door off of an Army Jeep one morning. The statute of limitations may still be in force so that event will not be recorded. There was that assault charge. Uh. No, nyet, nein. No story there. There was the time that I was on radio watch one night and swore loudly into an open mike for the entire world to hear. The aftermath is the story that I will not tell. I SHOULD tell the story about a buddy that got picked up by the German police for an incident at a house of dubious distinction. Maybe I will someday but, today is not that day. There was a time when I bought a plane ticket home and the ticket agent did not tell me about the fifteen hour layover in Houston. I did manage to stay out of trouble then. It was not easy and was only successful because I had no money. I stayed up all night once and drove a tour bus the next morning. Nobody died and I did not wreck the bus but I’m still not telling that story. On a dare, I stuck my face into a plate of two burning caps of CS gas and took a deep breath. The suffering on my part was legendary and maybe I will tell that tale one of these days. That was sooo dumb. I spent a whole day looking for a non-existent part for an Army truck, all the while, my boss and buddies were laughing their tails off (wait, I think I did tell that story). Finally, the evening I and my roommate spent serenading my future bride outside her window. Not telling that story either. She tells it better than me anyway. Yup, those were great years but there are just some things best left alone. It is Saturday morning and I am ensconced in front of my computer with a cup of coffee. (I’m not sure that one can actually be “ensconced” in front of a computer – maybe in front of a roaring fire but not a computer. Oh well, it’s there and I am not going to change it). My trusty cell phone (which, like my computer, does not lie) informs me that it is twelve degrees (that’s 12°) outside. I have made a decision that I will remain here with my coffee as long as I can get away with it. It will not be long as the matriarch of the house is up and about. She will no doubt spot my immobility and dig out the proverbial “honey do” list. No, but for the time I do have to me, I will endeavor to enjoy it with my coffee. Coffee has a special place in my heart. It kept me warm and awake on many a cold, dark night in the Army. The Army that I remember made their “field coffee” in ten gallon pots over an open fire stove (called an M-2 burner in those days). Most of the time, the grounds were dumped directly into the water. One was left to sift the grounds out with one’s teeth or take the risk of internal havoc and swallow it. Enterprising cooks of the day would fill Army-issue wool socks (new ones, I think!) with grounds and set them in the water. That procedure had nothing to do with making life a little easier for the soldier. They just did not want to have to clean all those grounds out of the pot and so create what we would now call a hazardous waste. Regardless of how they made their field coffee, it was never very good. It may eventually be found that entire legions of soldiers were permanently scarred, physically and mentally, by this evil mixture. The truth is that the value of that coffee came when we filled our canteen cups with the more than likely toxic concoction. The canteen cup was metal so conducted heat pretty well. Soldiers back then filled the cup to the brim and, most of the time, never took a drink. The only function of coffee for many soldiers back then was heat for his/her hands. The ones (including me) who took the risk of actually drinking did so out of lack of sleep more than anything else. So, as I sit here with my coffee and remember those cold nights, I do so with some degree of nostalgia and one burning question that I will never know the answer to. Did our cook “really” use new socks or am I bald for reasons other than heredity?